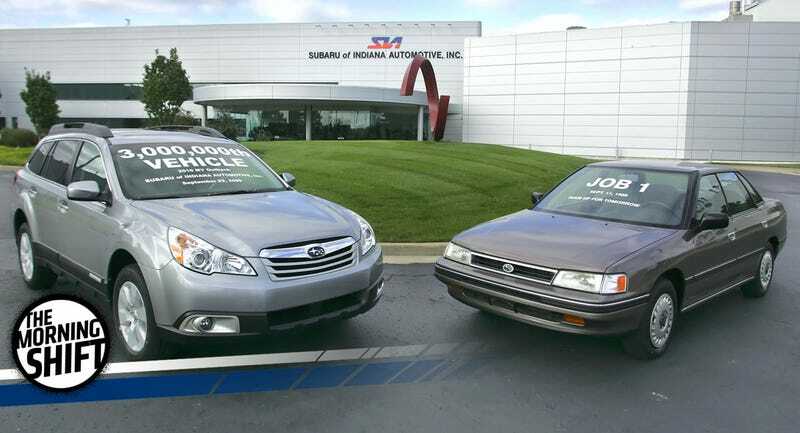 A 2009 AP photo that shows a 1990 Subaru Legacy L, the first car produced at SIA, and a 2010 Subaru Outback 2.5i, the three millionth vehicle to roll off the assembly line there. The American automakers are continually under fire for moving jobs, or appearing to move jobs with production shuffles, which few people outside the industry understand and tends to look bad. Do you know who’s not? Subaru, which is expanding its Indiana plant to build the next Impreza. At a time when small car sales are struggling, no less. The non-union plant makes 380,000 vehicles a year. The carmaker announced earlier this year it is expanding its Lafayette, Indiana, plant to produce its all-new, fifth-generation Impreza compact. The Impreza made its testing debut to media here this month and is now arriving in dealer showrooms. While political necessity often reduces trade issues to bumper-sticker slogans, the Subaru vs. Ford situation reflects the complex factors that drive plant location in a global market. Though Subaru won’t give precise figures on how many Imprezas will roll out of its huge, 3.4 million-square-foot facility, the Indiana plant is expected to meet U.S. demand for the popular, all-wheel drive sedan and wagon. The non-union operation makes 380,000 vehicles a year (including Legacy sedans and Outback crossovers). The previous-generation Impreza was made in Japan. Get out there and buy a real American car, like a Subaru. While General Motors won the first group of so-called “bellwether” lawsuits related to the defective ignition switch in multiple vehicles linked to 124 deaths and 275 injuries, it is now asking the U.S. Supreme Court to reverse a lower federal court decision that stated “new GM” doesn’t get a bankruptcy-related shield from those lawsuits. The Supreme Court will decide in the spring whether to hear the case or not, which means this fiasco—and the bankruptcy—will be back in the news again. Great? Investigators found the U.S. company had instructed distributors to fix prices starting in 2014, Zhang Handong, director of the National Development and Reform Commission’s price supervision bureau, was quoted as saying in the China Daily. In an exclusive interview with the newspaper, Zhang said no one should “read anything improper” into the timing or target of the penalty. The article did not give further details and the NDRC did not immediately respond to requests for comment. China, the world’s largest auto market, has become crucial to the strategies of car companies around the world, including GM and Ford Motor Co .
4th Gear: Can The C-HR Be ‘Fun’ And ‘Dynamic’? The C-HR goes up against early entrants in the fast-growing subcompact crossover segment, such as the Honda HR-V, Nissan Juke and Subaru Crosstrek. U.S. sales of subcompact crossovers surged 31 percent to 455,771 vehicles through November in a flat overall market. But Koba said the C-HR’s responsive handling puts it more in the league of the Ford Focus and Volkswagen Golf. Indeed, the Japanese carmaker undertook early development of the C-HR in Europe to better tune its driving dynamics to Europe’s winding roads and high-speed highways. Nissan Motor Co Ltd (7201.T) and Renault SA (RENA.PA) CEO Carlos Ghosn is set to receive a third salary after Nissan-controlled Mitsubishi Motors Corp (7211.T) on Wednesday approved the Frenchman as its chairman along with a tripling in compensation for board members. Shareholders voted in favor of raising the ceiling on combined annual compensation for Mitsubishi’s 11 internal and external directors to 3 billion yen ($26.06 million), including 2 billion yen in salary and 1 billion yen in stock options. Mitsubishi has revamped top management and appointed Ghosn to head its 11-member board after Nissan in October took a 34 percent controlling stake in Japan’s sixth-largest automaker, which is struggling to recover from a mileage-cheating scandal. Good for him! He runs three car companies now, the dude’s busy and clearly works hard! Neutral: Does It Matter To You If A Car Is Built In America? Not all Fords are. My old Toyota was. Does this make a difference to you as a buyer?